Lagunitas’ motto is “Beer Speaks, People Mumble” does that say it all? With beer names like Hop Stupid, Little Sumpin Sumpin, Gnarly Wine and Censored this place definitely speaks to beer lovers. 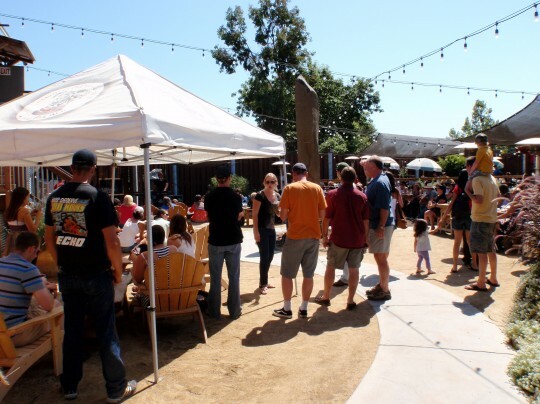 A true beer garden with great outdoor patio and indoor seating, (dog friendly) live music and now they are building a small amphitheater on the green, next to the “Swag Shop” for those who need to buy T-shirts and such to identify themselves as true believers that beer is better than wine! For me, I prefer only the original brew, Lagunitas IPA. A true ale with a wonderfully nutty flavor and golden color. For the more adventurous the pub offers many combinations of beer tasting specials, any 4 for $5 served in 4 oz glasses. Or, you can take home a 1/2 gallon “Growler” of any Lagunitas beer. The menu sticks to panini sandwiches, dips and chips, one salad, a simple cheese and fruit plate and newly added special sausage sandwiches and chili. Recently, I made a suggestion that the menu ought to include hand-made potato chips with a couple of dipping sauces as the Spring mix salad with vinaigrette is getting boring. They don’t want to intrude on near-by restaurants serving french fries so potato chips is a good bet. Warning: the chili is not so good and the sausage sandwich isn’t much better. But the Paninis and the Hummus and Pita Chips rock. The chips are very thin and crunchy. Last week they had a guy BBQ’g fresh oysters, yummy. All told, this is a find and a half. Best visited while the sun is still shining.